That's Krafty Thursday #55 - use Kraft on your project. Thanks so much for coming by. Still snowing here in NJ... and I am still in my PJ's in my craft room. It's a good day! Stamps ~ PTI Tiny Treats Halloween. Ink ~ PTI True Black, Memento Tuxedo Black. 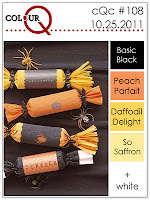 Paper ~ Kraft, Basic Black, Peach Parfait, Daffodil Delight, So Saffron, White. Accessories ~ PTI Woodgrain Impression Plate, PTI Mat Stack 4 die, Nestabilities circle dies, Dimensionals, stitched grosgrain ribbon, buttons, black jute, glue dots, corner rounder. This is sooooo cute! I just love the plaid piece you've used with the cute PTI image! Buttons are always a favorite with me! We had some snow today too! Thanks for playing with the CQC this week! Great card!! I love tiny treats:). Thanks so much for joining us this week at the ColourQ!!! Such a cute card. Thanks for joining us at the ColourQ this week. 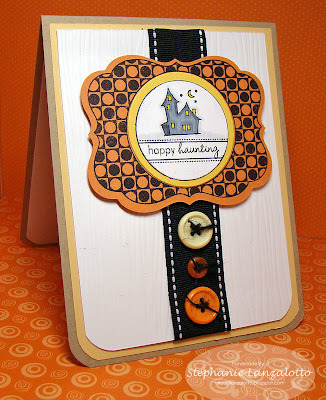 A truly gorgeous card and those buttons really add just the right "pop"! I just became a follower and would love if you follow me too! What a fabulous layout! Great way to use the colours!! amazing job! just beautiful! thank you for taking the stamping royalty challenge!! This is just a really beautiful and classy card! Thank you so much for playing with the colourQ and congrats on being chosen one of our colourQ Courtiers! It can't get much more elegant and fun at the same time!!! Love it!